You may recall seeing the beginnings of this quilt here back in March. I had the opportunity to test a pattern for Tish @ Tish's Adventures in Wonderland and Dave @ Dave the Quilt Engineer. Today is pattern release day, and here is my baby version of the Star Blossom pattern. Make sure you visit Tish to see other versions of the pattern. Each pattern tester is hosting a giveaway for a free copy of the pattern. This top has been finished for a month, but I couldn't decide on a quilting pattern. Because I work well under pressure of a tight deadline and wanting to be part of the pattern release today, I did a quick all-over stipple in white thread for a quick finish. The PDF pattern is available for sale for $10 in Tish's Craftsy Shop. However, to celebrate the pattern release, she is offering the pattern for $8 until Sunday, June 11. This is a great pattern, with lots of directions and photos. Giveaway - I have no plans for summer vacation 😢 and won't be making my annual shopping trip to the USA this fall. For a chance to win a copy of the Star Blossom pattern, tell me about your summer vacation plans. The contest is open internationally until midnight Monday, June 5, 2017. Cute! Love the bold colors! We don't have travel plans this summer. We might take some time and go to the coast for a few days but nothing's planned yet! so cute, I love the bright colors!!!! I just love the colors you chose for this! What a great baby quilt. So bright and vibrant. Love the colour combo and the pop of red, wow! We are having company from home visiting in July. I love your happy colours and whoa, did you get it quilted up fast, girl! Such a happy baby quilt! A lovely bright and happy baby quilt Anja! An allover stipple will keep it soft for a baby. ;beautiful colors! Our vacation plans are to take DGD#5 to a water park while we camp. She gets to swim to her hearts content; DH gets to visit the casino; I getbtonpiece in comfort; #D#4 gets to relax her way. A win win! I love this block. We are going on our annual fishing trip to Canada, no phones, no wifi, no roads. Deep into nowhere but beauty. We will be heading to ON for our son's wedding this summer. 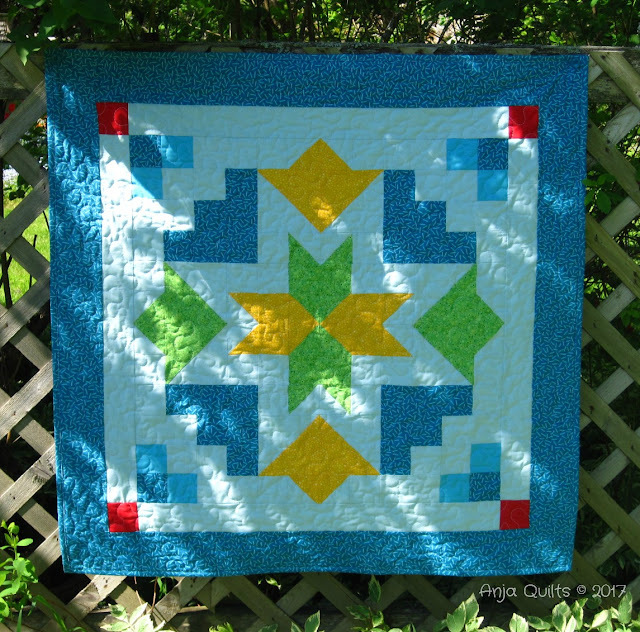 Love your fabric choices in this quilt. We're not really vacation folks-instead, we like to get together with family. We have a college graduation coming up in Maryland, and high school graduation in PA.
Beautiful! We haven't gone anywhere for vacation in several years. But I am hoping to get out of town this year. It's gorgeous, Anja! Tish and Dave came up with a great pattern and I love your version :) I'm hoping the weather will cooperate so we can get some camping in this summer...we go in a tent, so it has to be warm-ish and dry, which really hasn't described our summers the last few years. Here's hoping! This pattern is gorgeous and I'd love to win! As for vacation, we already went to stay in a beautiful cabin in a state park. I'd like to do that again before fall! It's delightful, Anja. Can't wait to hop over to Trish's to congratulate them. Summer plans.....let's see........the only plan is to spend a few days in the valley to see the shorebird migration in full swing. That, of course, means stopping at Avonport a couple of times. Our main attraction is tide dependent, so there will be lots of time to kill! Your version is stunning. My summer plans always include a trip or two to Amish country. 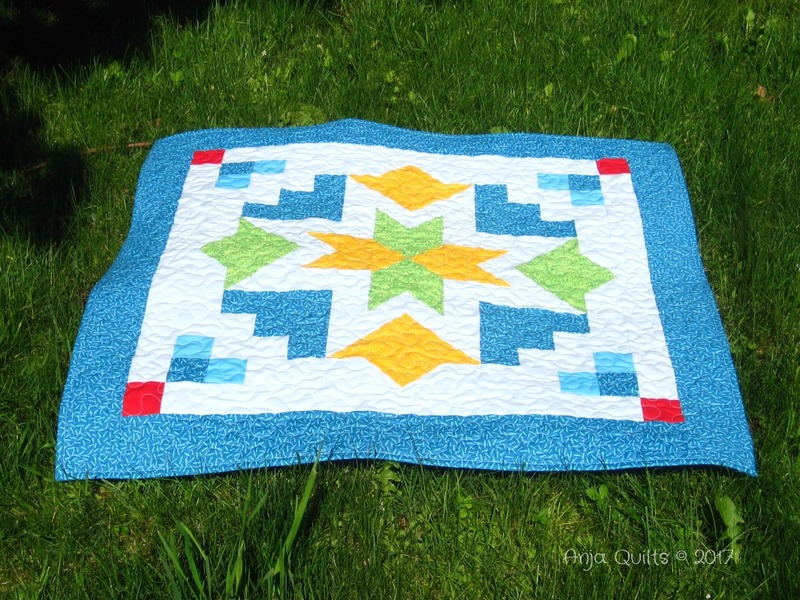 I love your color choices for your quilt! We have several babies joining the family in the next few months, so this would be a perfect 'instant gratification' quilt. For our summer vacation, we are traveling from Minnesota to Montana to visit friends who moved there 2 years ago. They will show us around and we'll drive some 4 wheel drive only roads, take in a minor league baseball game, and sit and sip wine on the deck while enjoying the mountain backdrop. Beautiful quilt and I love the stipple design which popped the quilt. Off to Hawaii in two weeks. Summer fun with the family includes cabin time too! What a great looking mini. Love the small pop of red. This is our big vacation year. He head to Germany and then off to Paris in a few weeks. Getting very excited! Thanks for the chance to win this pattern. I love your bright colors, so happy they make me smile. I need to make my niece a baby quilt and I might just steal your color idea and make a similar version. I'm not taking a summer vacation but am going to New England this fall for the first time in five years. I love everything about New England in the fall. I don't really have much planned for the summer.....it's my husbands busy time so I'll probably take a quilting vacation with a long weekend getaway with him on either end. I'm getting plenty of time off work these days helping my daughter in law with my two grandbabies....oldest 15months old yougest one week. 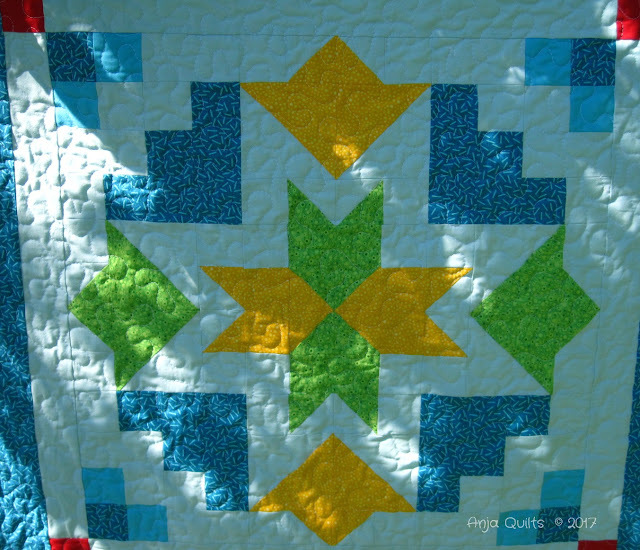 Lovely quilt, and I love Tish & Dave's pattern! My extended family will be going to Wildwood, NJ. My grandparents went there almost every year of their marriage, and in 2006 celebrated their 50th Wildwood vacation. They were not able to continue after that, but small family groups have gone every few years. This year, all 4 of their children, all 7 grand kids, and all 6 great grand kids will be there together. I love your version Anja! The primary colors give it an entirely different feel!